BROWNSVILLE, Texas — The Port of Brownsville, the only deepwater port located on the U.S.-Mexico border, completed its first public opinion survey of port tenants, logistics, stakeholders and other service personnel, revealing that 95 percent view the port favorably, with 57 percent of respondents planning to increase their port business activity in the next year. IMPACTFUL: Ninety-five percent of respondents are favorable towards the port, with 82 percent citing that the port has a very positive impact on the Brownsville economy. Respondents believe that the Port of Brownsville positively impacts the economies around it, particularly Texas as a whole, thanks to steady job creation and the port’s position in global trade. IMPROVING: Seventy-one percent of respondents say their opinions of the port have improved during the past five years. The Port of Brownsville has become a major economic player responsible for more than 44,000 jobs and with $43 billion in potential new projects in development. EXPANDING: Fifty-seven percent of respondents say they’ll do more business with the port in 2019, with 80 percent citing excellent to good intermodal connections. 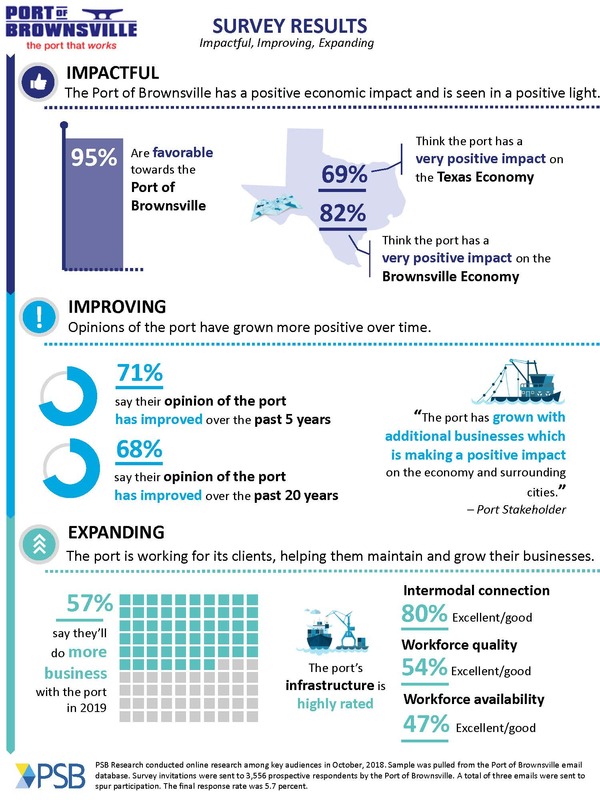 The majority of its clients agree that the port has the resources needed to help maintain and grow their businesses. Across the board, those who do business with the Port of Brownsville expect to do the same amount of or more business with the port in the next year. The survey was conducted via 15-minute online interviews among key audiences in October, 2018. The port contacted 3,556 prospective respondents including stakeholders, tenants, operators and logistics personal, among other port service providers. Response rate was 5.7 percent.